They are usually our direct connection to the extraordinary palette of sounds we have literally at our fingertips. The piano keyboard still reigns supreme as the most common input device. But there’s also innovation in all sorts of directions. Whether that’s in performance and sensitivity or integration with software, the humble MIDI controller keyboard is being forever re-invented. Here are the 5 MIDI controller keyboards that for my money offer more than just somewhere to put your fingers. ROLI didn’t invent the idea of Multidimensional Polyphony Expression (MPE) but their innovative keyboard controller has certainly done the most to push this extension of MIDI into the mainstream. The basic idea is that MPE allows for 5 dimensions of control for each played note. You have the familiar pitch and velocity, but then you have forward/back for parameter changes, side-to-side movement for pitch bending and pressure for timbre. And all of these are per-note. It’s not been a dramatic revolution and there are still very few products that support MPE. 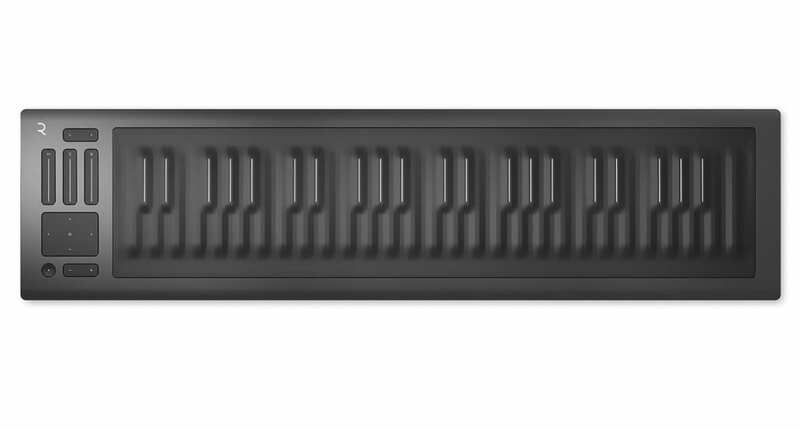 The Seaboard keyboards ship with their own MPE capable virtual synth. Other notable supporters are Bitwig Studio which can record and edit all the MPE data within the sequencer. The RISE 49 brings the technology down to a slightly more affordable level and fits easier into an existing setup. It’s a gorgeous piece of equipment with potential for amazingly expressive performances. We’re just waiting for everyone else to catch up. It’s not a great looking keyboard but it’s got interesting things under the hood and out the back. 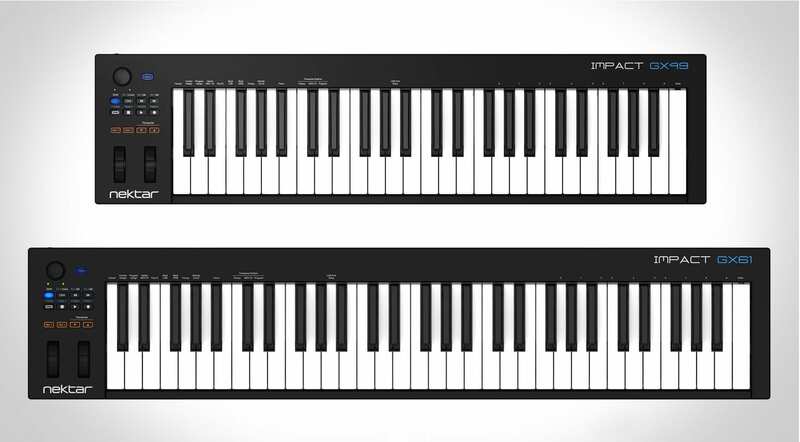 The Arturia Keystep has a built-in polyphonic step sequencer with up to 64 steps and 8 notes per step. 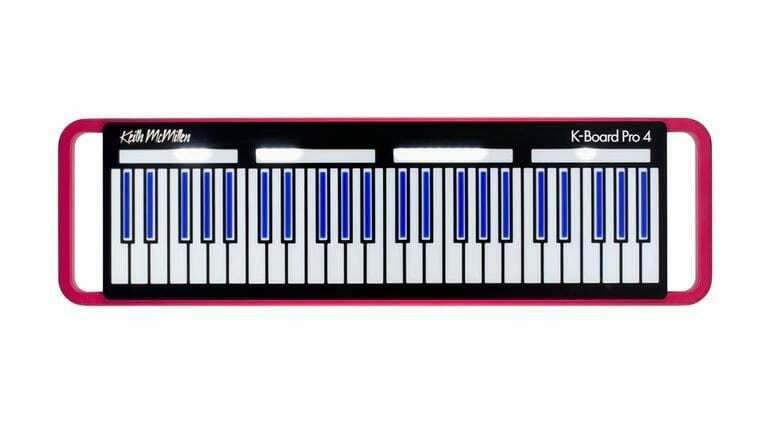 You can store up to 8 sequences and recall them with the turn of a knob. But the great thing is that out you can squirt these sequences out to analogue and modular gear via the CV/Gate outputs on the back. Completely genius. Now you have a playable, portable sequencer for all your external synths and modules. Of course, it also has MIDI I/O and USB for computer connection. It’s a fabulous little tool and they sell it for £99. More information available on the Arturia website. The thing that’s interesting about the Akai Advance keyboards is the VIP software. VIP is a VST instrument and effects host that automatically maps all the plug-in controls across the keyboard’s encoders and buttons. 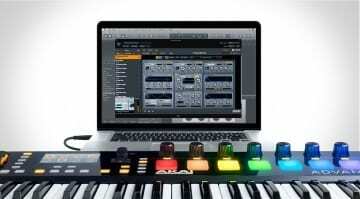 It allows you to build huge multi patches with different virtual instruments combined and controlled from the single keyboard. The Advance keyboard also has a little full-colour screen for displaying all sorts of information from the virtual instrument. It’s the sort of integration that would make live performance an absolute dream. However, this sort of integration comes at a cost. 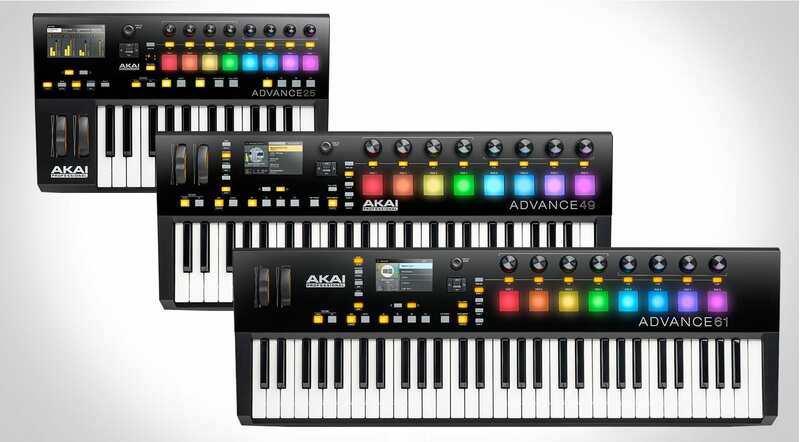 There are three versions of the Akai Advance keyboard, all semi-weighted. The Advance 25 gives you 2 octaves for £239, the Advance 49 gives you four octaves for £399 and the Advance 61 stretches it to one more octave for £449. There’s also some other options with the same VIP integration from M-Audio and Alesis who are all owned by the same people who own Akai. 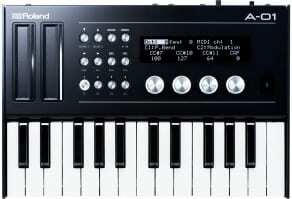 M-Audio has the CTRL49 at £349 and Alesis has the VX49 for £299. Might be worth checking those out as well for the perfect combination of features to suit what you need. More information on the Akai Advance website. 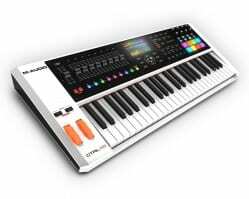 Nektar produce a lot of very capable keyboards but what interests me about the Impact GX range is that they are simple. They are the exact opposite of everything else on this page. They have very little beyond the keyboard, pitch and mod wheels. And that’s awesome. Sometimes you just need a decent quality no fuss keyboard that’s not going to monopolise your desk space. I reckon a lot of people don’t actually use the knobs and pads that seem to come as standard on most MIDI keyboard controllers. In which case save your money and pick up a GX41 for only £89 or a GX61 for £99. More information available on the Nektar website. Never quite sure if this a real product or even if it will ever get released. It seemed to be heading for release but then KMI decided they needed to float it on Kickstarter. They are not far off their goal with a week or two to go but I have a feeling that they expected masses of interest rather than the 117 backers they’ve got so far. 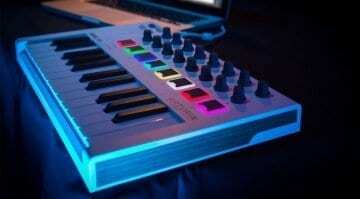 In any case it’s the only keyboard out there giving ROLI a run for their money. 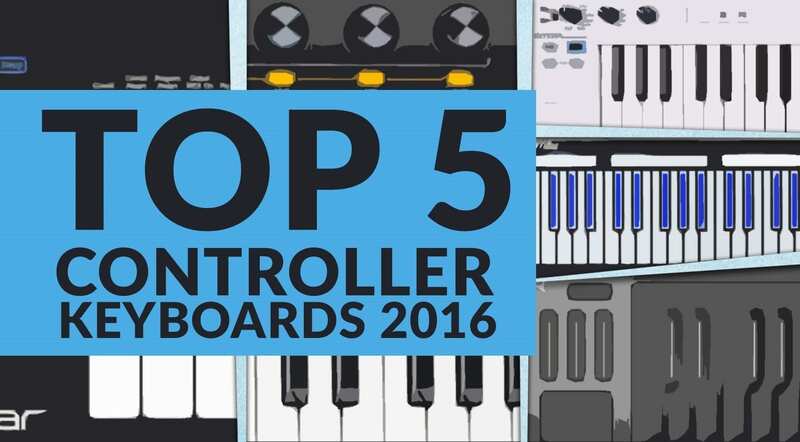 It has none of the style of the Seaboard controllers but it makes up for it by being compact and half the price. I’m a big fan of MPE, which is what this keyboard is all about, and I’d like to see this do well. Hopefully, when this Kickstarter business is done KMI will actually start making some and selling them – thay would be good. You have until the 21st December to get in on the Kickstarter – go and push them over the edge.